Genre: Action/JRPG. Other versions: PS3; PC. Dragon Quest Heroes marks Omega Force’s latest attempt to insert their trademark Musou gameplay into another established franchise. Known for their successful, if critically divisive, Dynasty Warriors series, we last year saw Zelda and Musou combined in Hyrule Warriors, which proved a success. Now, Dragon Quest mixes the large hack ‘n’ slash battles with this beloved JRPG franchise. But it’s not as simple as “Dragon Dynasty Heroes”. In fact, it more resembles an action RPG than a hack ‘n’ slash game. But does it make for fun? The game opens with humans and monsters celebrating in harmony. Until suddenly, the monsters turn heel and start attacking, holding all the major areas of the world under siege. The basic premise is that the player, who can choose between a male and female lead while the other becomes an ally, must find the source of this change and restore harmony between humans and beasts. It’s pretty straightforward, heightened mostly by the appearance of several main characters from older games, ranging from Dragon Quest IV all the way to IX. It has a decent sense of wit, keeping the tone very light-heartened, but it’s also not especially memorable. Dunno why, but the local club-wielders I encounter almost never smile. Dragon Quest Heroes will be familiar instantly to fans of both series. The gameplay is traditional Musou, with your offence including two main attacks and magic spells. You can alter control schemes to a simpler one, allowing you to string combos together without much thought. You can also defend yourself with a block and dodge move. It’s a pretty straightforward system, but the complexity comes in the variety of characters to use. Your two default heroes are solid all-around, while King Doric’s great strength contrasts with Isla’s more distant attacks. Some are harder to master, but you’ll enjoy using almost all of the characters. The last wrinkle to gameplay is Monster Minions, as eventually coins will drop after killing enemies, allowing you to summon them on the battlefield. These range from Sentries, who will hold position until death, and quick-use minions who cast a short spell then disappear. It’s a fun feature, and certainly an aid in those tougher battles. It’s the JRPG twists which make Heroes more enticing than perhaps some other Musou games. The key trademarks of Dragon Quest are in place, including the classic pub to change your squad. Characters level up as your kill enemies and earn XP, allowing you to allocate skill points to a series of skills and attributes. The game’s overworld map screams classic JRPG. And though you can’t free roam as such, you can go back to areas and grind for loot and XP. The side content is made up of brisker Quests, which can vary from collect-a-thons to more direct battle arenas. Outside of combat, your hub base allows you to buy weapons, protection orbs, earn mini-medals for killing a number of enemies and create accessories using alchemy. It adds a nice layer to Heroes, making it feel like a Dragon Quest game while shaking up the gameplay. Dragon Quest Heroes' greatest problem is it's repetitive nature. This goes without saying: critics cite this as an issue with nearly all the Musou games. But it’s more the structure of missions that causes headaches here. It feels like, in the case of both quests and main missions, that things boil down to either defending a point while being assaulted by hundreds of enemies, or merely clearing an area of foes. The defend missions aren’t too bad at first, but once later missions begin to up the stakes with multiple spawning portals of tougher foes, it can become tedious, especially if you die close to the end of a mission and are forced to restart the whole thing. The combat doesn’t degrade too much over time, but it can become exhausting after you reach the twentieth or so hour. The story doesn’t help either, often becoming anti-climatic and causing you to sigh in exhaustion. At least the game looks great, as Dragon Quest Heroes boasts excellent visuals. The way Akira Toriyama’s designs are brought to life on the eighth-gen are stunning, as while keeping the charm of the previous games, the detail here is excellent. While levels can look a bit flat, the game compensates for smoothness. The game never falters under pressure, with hundreds stunning monster designs clashing with your well animated characters. The audio is good, benefitting from using nostalgic tracks and a very British translation, sounding similar to Dragon Quest VIII. There are a couple of grating characters, particular the intensely whiny Helix, and the music can loop at a couple of points. But overall, the senses are pleased here. There’s plenty to sink your teeth into as well. The main quest should conclude around the twenty hour mark, and upon completing, a new game+ option is available. Before even that, there are about 100 quests to take part in. And attempting to find all the monsters, equipment and recipes will take a lot longer. 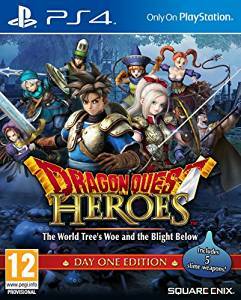 Plus, as a bonus for Western gamers, all that DLC which came out in Japan comes free on the disc, incorporated into the game which includes new quests and a bonus character. In the end, Dragon Quest Heroes should please both fans of Dragon Quest and Musou games. It’s fresher than other titles in its lineage, nicely mixing JRPG sentiment with the large-scale battles we’ve come to love. In this respect, it will appeal to both crowds. However, it does suffer from a thin plot and repetition, which may turn away those with less commitment to this genre. But if you’re looking for a pretty, well made action RPG, then Dragon Quest Heroes will be right up your alley.